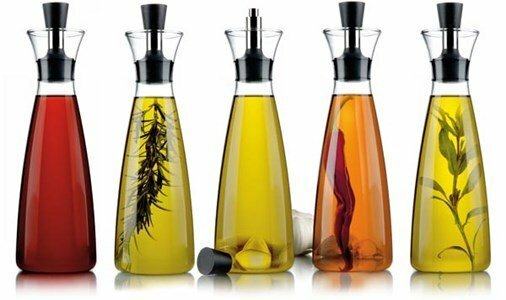 dressing shaker, to season with flavour and design. Give it your own personal hint, try blending herbs. They come in two sizes and they will impress everyone at the table.... as one or as a set, they promise to delight everyone with their flavor and design! Thanks to the lid's design, the flavour and the aroma will be preserved longer. 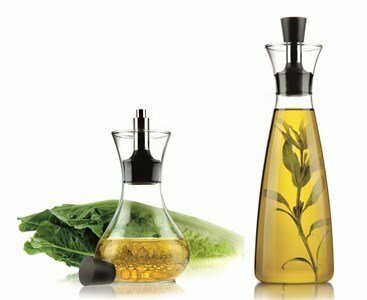 You can mix vinager and olive oil in the jug, then just shake a little and the salad seasoning is ready to be used! 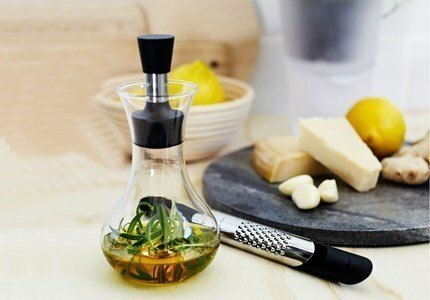 Combine olive-oil with basil, thyme, rosemary or chilli, and a pinch of salt... The vinagre, balsamic, with black pepper or sage... hummmm.... delicious!!!! Includes the patented system Drip-free - pouring spout - from Eva Solo. Made of glass with a stainless steel and silicone doser. Designpreis 2008-Nominee-German Design Council, Germany. Designpreis 2007-Nominee-German Design Council, Germany. Red Dot 2006-Best of the Best-Design Zentrum Nordrhein Westfalen, Germany.